When you start using high magnification binoculars, you may notice that you need to keep your hand a lot more stable compared to using a lower magnification binocular. This is mainly because with higher magnification, the binoculars become a lot more sensitive to movement, which means that if you don’t have a steady hand or if you aren’t using a tripod, then your vision will be blurry most of the time. To solve this, you can either purchase a tripod and use your binoculars in one rooted position, or purchase an image stabilization binocular and have your binoculars do the stabilizing for you. Image stabilizing is when you click a button on the binocular and it uses batteries to stabilize everything for you. This is done by your binocular automatically sensing movement and reversing it, so that your vision stays consistent and clear, even at high magnification. 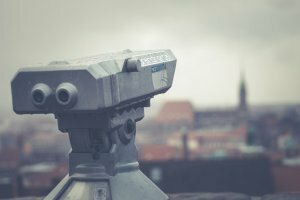 Some features that you should look out for in an image stabilized binocular are the features, qualities, and price. If choosing the right product is hard for you, we recommend that you choose one of the products we review below, as they were picked out of the many available because of how great they were. Known as one of the most budget image stabilization binoculars, if you are on a tight budget, this one should be the one you should consider. As most image stabilization binoculars are extremely expensive compared to normal ones, it may be hard to afford them, but this one is a lot more affordable. Although it does compromise on quality, features, and magnification, it is affordable, which is why we recommend it to those on a budget. Some features that this product comes with that we liked were the multi-coated optics, flattener lens, and design. The multi-coated optics help gives you a better view as it will give you a better contrast of what you are viewing, giving you more clarity and fidelity. The flattener lens helps give your view a more even view, as a rounded view often ends up looking weird and may also cause headaches. Lastly, the design is something that we loved because the rounded design gave us more locations to hold the binoculars and made it look a lot more premium as well. 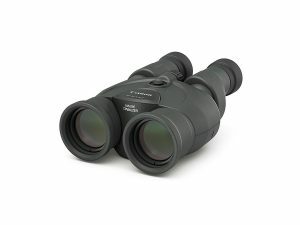 Overall, this product is great if you want an affordable binocular, but with optical image stabilization, as this product can last for quite some time and comes with some great features as well. This product isn’t as affordable as the product above, but a bit more reasonably priced or average priced. This product is intended for more experienced people and maybe a bit too expensive for amateur use. As there is more than one degree of stabilization, you will have a lot more flexibility when choosing the level of stabilization, you need. This product is also waterproof, so even if there is rain or water gets on your binoculars, the image stabilization feature won’t break or stop working. This is a great feature because of how image stabilization actively uses a battery and if water gets in this reaction, then there is a high chance that your binoculars will break. The quality of this product is also great, as it is designed to be used for a very long time. There is a handle on the side of the binoculars which allows you to hold your binoculars while your binoculars do its magic and stabilize your view. 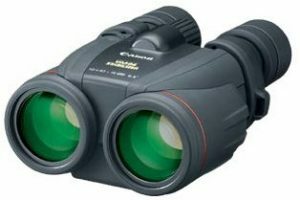 Even if you take this binocular on a very shaky boat trip, you will be able to maintain a clear view if you bring the stabilization to the third level. Although this product is a lot more expensive than the Canon 8×25, it is more durable, has better features, and is also weather-proof, making it a better buy if you can afford it. This product is made by the same brand as the first product, but there is a big difference in a few aspects. First, there is a small price difference, as this product is a lot better in general compared to the other one. Second, the magnification of this product is x10 while the other is x8 which will let you zoom in a lot closer to your target. As this product comes with image stabilization, having higher magnification is a lot better, since you won’t have to worry about the sensitivity levels and only enjoy the high magnification. This product comes with a few features to make it even better than the Canon 8×25. This product comes with Porro II Prisms which aids in giving you a better resolution and to maximize the efficiency of all the light around you to give you the clearest view possible. 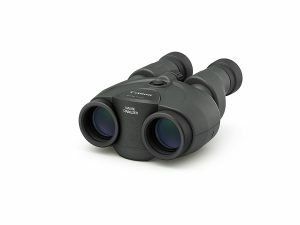 This product also has a few more features that reside in the optics to give you the highest definition view possible, so if you are one that likes high resolution, then this product is the one for you. Overall, this product is great if you are okay with spending a bit more than the budget amount and if you want a higher resolution, as this product has one of the best resolutions out there. 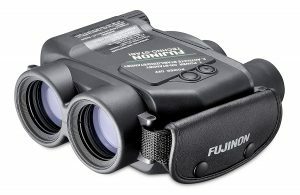 Fujinon makes an immediate comeback on this list with an advanced version on their image stabilization binoculars. 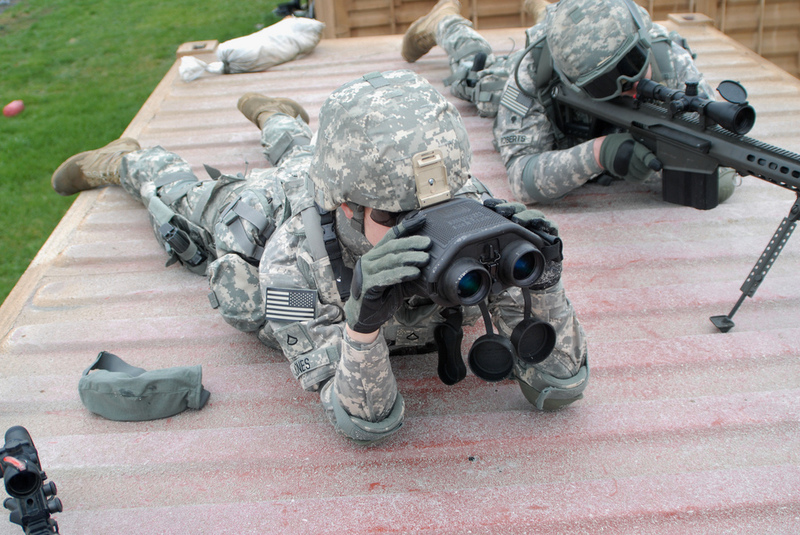 This 4-pound magnification device can help you focus on your target with a magnification of x14. 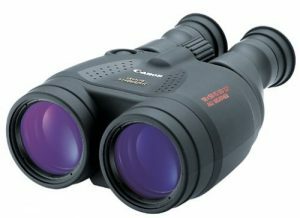 The high magnification aspect of the binoculars paired with the image stabilizing tech of the device makes a great observation tool for outdoorsmen. Even though a robust machine, the Fujinon Techno Stabi TS1440 does not require any out of the ordinary power source as 4 AA alkaline batteries will suffice. the total power back up comes to around 4 hours with image stabilization and 30 hours in standby. The device saves energy by automatically shutting off the image stabilization feature if it has not been in use for a minute. The exterior is designed using waterproof polycarbonate while the glass is a fog proof reinforced fiberglass. This is a great product if you are to use if you are going to an outdoor activity. This is the first product by Canon which has integrated their image stabilization technology with attributes of waterproofing in order to give the device more durability and protection from such elements. Along with being known for the waterproof case, it also boasts 2 ultra-low dispersion lens elements, which when paired with the accuracy of image stabilization, delivers excellent view with chromatic aberration correction. The power is provided using two AA batteries, but if the image stabilization is not in use, the batteries are not required. Known for its picture quality, Canon lenses guarantee crisp and clear pictures which when paired with image stabilization makes this a dream device for wildlife safaris. 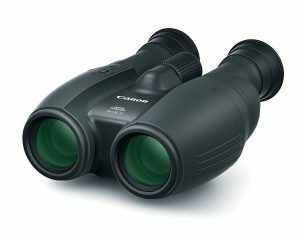 The product is a well fit for star gazing, wildlife watching and navigation. Though higher in price range this device makes up the gap with its picture quality. Canon is known for making the best optical devices in the market, but now they have improved their game by making the device fit to be used in any external environment possible. The 18x magnification of the device pairs well with the image stabilization (IS) technology giving you clear and crisp long-range imagery. The is powered using 2 AA batteries, which is a comparatively smaller power source but does not bargain on the quality. Being all-weather, we need to have a look at the exterior. The design is compact and has a very comfortable hand feel. The rubber used for the exterior coating provides good grip, keeping them waterproof and shockproof. The anti-fog lenses come in handy during the rainy season. Can be used for safaris, sea cruises, watching stadium games, or hunting. A handy optical device for all occasions. Grab this beast of a device offering so many features. 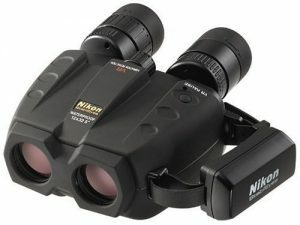 Nikon finally makes an entry in this list by creating the Nikon 7457 14×40 Binoculars and does not disappoint. the device weighs 6 pounds, a little on the heavier side than all the products mentioned above but makes up for it with the x14 magnification which when paired with the image stabilization (IS) technology and waterproof casing gives us a device which is a must-have for a captain before his/her next sea voyage. Along with IS, Nikon took it few steps further by adding vibration reduction and dual stabilizing modes (LAND/ONBOARD). Though the additional modes are a strain on the four AA batteries, but worth it. The external casing is well built, sturdy yet with a satisfactory hand feel. The device is best suited for personnel on a ship, but also for people who don’t want to compromise on quality. A phenomenal optical tool, Canon Cameras US 14×32 (IS) is one of the most compact devices out there, at about 1.71 pounds, which does not compromise on quality to save space. This x14 magnification device gives great clarity and contrast pictures, which along with Canon’s image stabilization (IS) tech gives you clear pictures. Canon went a step further and added the lens shift technology integrated with the IS to enhance the picture quality further. The casing is well built, sturdy and has a very comfortable and satisfying hand feel. The right side of the casing has two buttons to toggle between powered and normal IS. Canon does it best when it comes to lenses and has done so again here by using field flattener lenses for countering blurred effect and super spectra lens coating to avoid color bias and lens flare. A great optical device for the outdoorsmen. 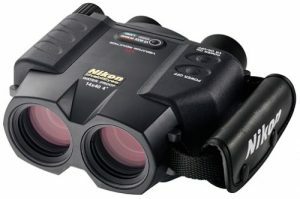 Nikon has been known to come up with high-end optical devices, and with the Nikon 8212 StabilEyes, they have taken the image stabilized binoculars market by storm. Not only is the x12 magnification of this device made even better with the image stabilization (IS) technology, but they went ahead and threw in vibration reduction (VR) too, making this a superior device. Th outer casing is very sturdy with the side hand guard and waterproof. Comes with a VR Pause button if the device needs to be used on the ground with better quality. The device is best suited for a sea fairer, as the VR tech reduces the errors due to disturbances by sea tides. 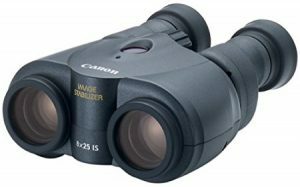 This may be the lightest and the cheapest binocular on the list, but don’t be fooled as Canon is not known to play with quality no matter the price range. The x12 magnification binocular comes with image stabilization (IS) which helps provide shake proof imagery. Weighing in at 1.46 pounds, the device is easy to hold, has a very satisfying hand feel and sturdy exterior body. Since the device is small, the IS only requires one AA battery but provides the same crisp quality of the picture. 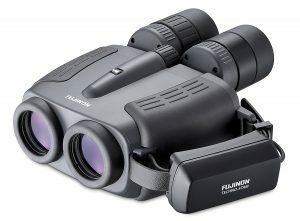 Whether you are going birding, hunting, or whale watching, an image stabilization binocular is always handy, as you will be able to use a high magnification binocular without having to worry about keeping your hand steady. 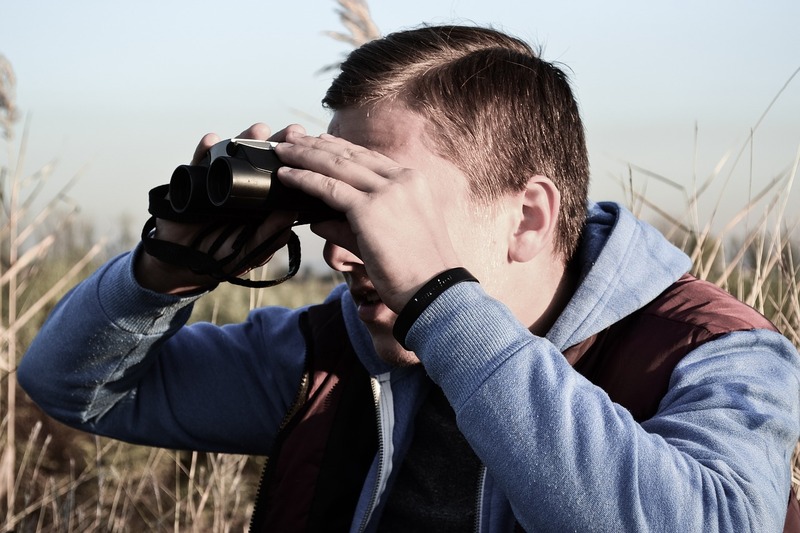 The investment required for this type of binocular is a lot more than regular binoculars by a huge margin, so we recommend that you think about your needs and decide if it’s worth it for you. If you do decide to get it, then we guarantee that you will love the stabilization feature and you’ll never be able to go back to a regular binocular.